In the Canary Islands, Guarapo is the name given to the sweet juice obtained from the canary palm (Phoenix Canariensis Hort. Ex Chab), which is elaborated not only to make palm honey but also to obtain a sweet drink which has the same name, among others. The Guarapo is a mixture of pure and elaborated sap that flows from the heart of the Canary Palm, it is very sweet and it has a peculiar taste, it is very refreshing and energetic drink due to its high concentration of minerals. The Guarapo or palm sap is obtained by cutting the superior part of what is known as the heart of the Canary Palm, previously removing the young leaves from the palm tree and as a result we have a vegetable juice of high nutritional value. After the conquest of the Canary Islands, 19th C on behalf of the Spanish kingdom, the historians of the time collected stories on the ethnographic and cultural aspects of the Canaries. One of these aspects was how they obtained sap from the palm and used it as food and it was also used popular for medicinal purposes by the aboriginals. This activity has been around for at least 500years, and nowadays it still maintains the same techniques and variants which guarantee its continuation. This technique used to take place in all of the Canary Islands, yet nowadays its use has been relegated exclusively to La Gomera. 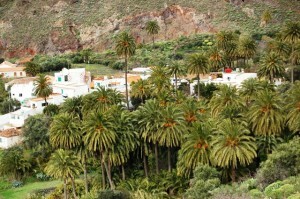 Palm honey, made exclusively from the sap of the Canary palm (Phoenix Canariensis Hot.Ex Chab), is the queen of the gastronomy of La Gomera, not only is it used to prevent illnesses, it is also used as an ingredient for desserts, cocktails or accompanying different dishes. Palm honey is the most striking and evident representation of the close relationship between the inhabitants of La Gomera and the palm tree, creating a genuine culture associated to this plant.